US — A study of US adults has revealed that nearly 30% of respondents would be ‘a lot less bothered’ about personal data collection if they knew what data was being collected and why. The study of 385 adult Americans, conducted by data intelligence firm Software Advice, found that 74% of respondents would prefer for their data not to be collected or used at all. Over half ( 54%) strongly agreed that there should be tightened regulations around how companies collect and use customer data. 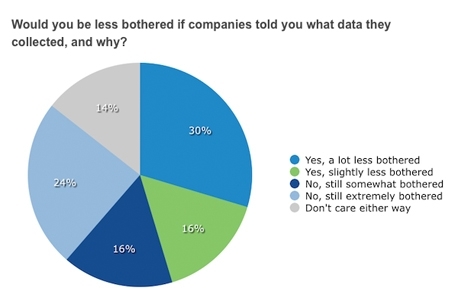 However, nearly 30% of respondents said they would be ‘a lot less bothered’ about personal data collection if they knew what data was being collected, and why. A further 16% said they would be slightly less bothered in this situation. Younger respondents were, on the whole, more open to data collection.